As Iraqi parliamentarians prepare for a possible vote on the draft election law tomorrow Saturday, their minds seem to be increasingly focused on the revised UNAMI/US-inspired compromise proposal for Kirkuk. The proposed arrangements are perhaps a little convoluted, but they do seem to constitute a real compromise in that they offer something for everybody: Voter rolls from 2009, as per the Kurdish preference; a one-year investigation of those registers followed by a possible re-vote, to address Iraqi nationalist concerns; two compensatory seats for Arabs and Turkmens respectively, geared at the more local interests of those two communities in Kirkuk. Whereas there seems to be general agreement among Iraqi parliamentarians that this is the most promising solution, some Kurdish politicians have been expressing doubts about the “constitutionality” of the proposed arrangements. However, it is clear that in this case the constitution is unlikely to be a problem. The idea of compensatory seats was established as part of Iraqis proportional representation election system back in 2005, and the notion of special representation for selected communities (with which it is now being merged) was adopted in the provincial election law last year, and is also part of the current draft. Crucially, the definition of what constitutes “selected communities” has been completely ad hoc and situational in both cases – i.e. a limited number of seats are offered in certain areas to guarantee a minimum quota for communal interests which it is feared may not gain adequate representation through the open electoral contest. This is done on an asymmetrical and case by case basis and is not intended as an exhaustive subdivision of Iraq according to ethno-sectarian identities. For example, Christians may be allocated seats in Baghdad without being allocated seats in Basra and so on. In other words, the only difference between existing laws (also supported by the Kurds) and the new proposal is that Arabs and Turkmens in Kirkuk are designated as groups that will get a guaranteed minimum representation, in practice much in the way the Shabak of Mosul will. This is done because of an expressed concern that changes to the electoral registers of Kirkuk in the period between 2004 and 2009 may have marginalised these communities to the point where their level of representation in the ordinary constituency is seen to be at risk. Conversely, no one doubts that Kurdish interests will have benefitted from those same changes and will be amply rewarded in the ordinary constituency for Kirkuk; accordingly, the Kurdish demand for a compensatory seat of their own makes no sense. For these reasons, the possibility that the Iraqi federal supreme court will reject the new Kirkuk proposal is close to zero. If the court did that, it would find it exceedingly difficult to argue for the constitutionality of the 2008 provincial election law and indeed the minority clauses of the current draft parliamentary election law (where for example Christians in Dahuk and Arbil will get one seat each according to the latest publicly available draft; quite possibly these will go to pro-Kurdish politicians). True, the supreme court has in the past rejected the idea of four separate constituencies for Kirkuk on an ethno-sectarian basis, but an ethno-sectarian quota system and a compensatory seats regime for selected communal groups are two very different animals. The former would lead towards the “Lebanonisation” of Iraq which most Iraqi politicians reject (note that the previous demand for quotas in the administration of Kirkuk by Iraqi nationalists has always been presented as a temporary arrangement pending a more wide-ranging settlement); the latter is a far more dynamic device that secures the continued potential for cross-sectarian politics while at the same time guaranteeing a certain minimum representation to avoid the complete marginalisation of communities that are deemed at risk. 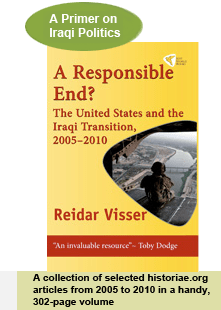 So far, the definition of those forces – by community and governorate – has been the prerogative of the Iraqi parliament. There is therefore no reason to question the ability of the existing framework to accommodate compensatory seats for the Arabs and Turkmens of Kirkuk in a constitutionally sound manner.